If you’d held banking shares for the last 30 years, and those share prices and dividends had increased in most of those years with only a few hiccups, one can understand the sentimentality and attractiveness these names carry in the minds of investors. This, of course, doesn’t make that thought process right. Investors, as with all investments, still need to focus on the future; what is to come, rather than what has happened in the past. When looking back over recent decades we would argue that the economic conditions created a ‘Golden age of banking'. Many economic elements moved in a favourable direction over the same timeframe. However, as we argue here, this Golden age of banking is over. Interest rates fell from above 15 per cent in the late 1980’s to record lows enabling borrowers to borrow more by improving their capacity to service loans. Financial services were deregulated throughout the 1980’s, reduced credit rationing and increasing the accessibility of credit, enabling banks to test the extremes of fractional-reserve banking practices by lending more and increasing leverage ratios. Major economic reforms such as privatisations, trade liberalisation, dismantling trade union influence and the advent of the mining boom helped drive productivity gains in the 1990’s and ultimately the acceleration in Real Wage growth. Real wage growth and falling interest rates improved the credit quality and serviceability of the borrower helped facilitate an acceleration in bank credit growth. This was helped along by the increased prevalence of non-bank lenders who helped disseminate credit across a rapidly growing population. Bank lending standards relaxed over time, buyers began stumping up less cash as a deposit and took on higher LVR loans, while the introduction of new products such as ‘interest only’ loans accentuated the level of household indebtedness. The outcome of these things is that buyers had the capacity to borrow more money, allowing them to turn up to crowed auctions armed with truck (car loan of course) loads of cash enabling them to bid longer and higher than ever before whether it be on their dream home, or a shoebox investment property yielding gross 3.00%. Consequently, housing prices “went through the roof” aptly supported by things such as taxation treatment of property, SMSF investment and population growth. These six key indicators have essentially gone into reverse bringing an end to the ‘Goldilocks’ environment that has supported the golden age of banking for so long. While some of these key indicators are still increasing, for instance, wages and bank credit is still growing in an absolute sense, the distinction needs to be made between absolute growth and the rate of growth. This is how these six key indicators look now. Interest rates have started to move higher globally, while the banks have started to increase their mortgage rates out of cycle with the RBA increasing debt servicing costs. In light of the royal commission, financial services are likely to become more regulated, if not legally, at least implicitly. Banks, with pressure from the regulator APRA, have already begun tightening their lending requirements and decreasing their leverage ratios. It has been well publicised that wage growth has been anaemic for some time now. After spending much of the last couple of decades growing at around 4%, wage growth now hovers around historic lows having failed to keep pace with household debt and hindering the capacity of borrowers. Credit, although still growing, the rate of growth has fallen from above 10% during the 1990’s and 2000’s, to below 5% and trending lower. Household debt has risen from approx. 60% of disposable income in 1988, to almost 200% of disposable income today. Perhaps a more accurate measure is the level of Net household debt (a figure that takes into consideration currency & deposits). The net debt figure has plateaued in recent years at approx. 110% of disposable income, but nevertheless up from around 15 in the early 1990’s. The House price to income ratio has increased from 4x to over 18x since the late 1980’s. The rapid increase has simply driven housing costs out of reach for many. Rising rates and stricter lending standards have contributed to the largest monthly fall (0.9% m/m) in house prices since the GFC. Prices have now fallen 7.1% since the 2017 peak, larger declines than those experienced in the aftermath of the GFC, leading some to conclude that the current downturn may well prove to be the longest and deepest in modern history. Aside from these broad thematic changes, there are other issues eroding the attractiveness of the banking sector. It must be considered that the Australian Banks, unlike international competitors, are highly exposed to a single domestic housing market which has shown clear signs of softening in recent months. Much of bank profit growth in recent times has been driven by the low level of bad debts due to the record low-interest rate environment making it easier for people to service their loans. Nevertheless, it should be noted there is a product mix element that needs to be considered. In recent years given the improvements in corporate earnings and profit margins, corporate stress levels have fallen. This has somewhat offset the increase we’ve started to witness in household stress levels. Falling stress in the corporate loan market has also resulted in favourable changes in capital composition. The banks have achieved APRAs capital targets faster than was originally anticipated given the fact that corporate debt carriers greater risk weights than residential mortgages. The question is whether the historically low level of bad debts, whether it be corporate debt or residential debt, is likely to persist in an environment of rising rates? Our belief is that it is highly unlikely and as such we would expect to see the tailwind to profits turn into a headwind. When considering bank profitability, it’s worth noting that the big four Banks have been forced by the regulator APRA into holding greater amounts of capital on their balance sheet, while also being forced to reduce leverage by tightening their internal risk models. Although holding more cash and reducing leverage reduces risk, these measures are ultimately counterproductive to bank profitability. By increasing the amount of equity (or idle cash) on the balance sheet, downward pressure is placed on the bank’s return on equity (ROE) and adversely impacting intrinsic value. Sacrifice market share and partially protect profits. The events of recent months have demonstrated that the banks, with the exception of NAB, have opted for the latter option and increased rates out of cycle after an extended period where the social pressures emanating from the royal commission delayed what was arguably inevitable. As it stands the banks find themselves in a situation where funding costs are rising and pressuring net interest margins in the process. In order to arrest the slide in revenues and boost their declining return on equity (ROE) the banks have in essence been forced to increase rates in an attempt to protect profits and shareholder returns. Typically, as the cost of debt stops falling, or indeed begins to rise, the reduction in the supply of credit begins to act as a drag on the loan book growth, and eventually the housing market and broader economy. This virtuous cycle set in motion by the banks themselves, may well eventually hinder their own future profitability. In addition to the above, there are the recent events of the Royal Commission to consider. Notwithstanding the other issues raised a key question facing the banks is how they are going to maintain business and revenue momentum while upgrading governance and risk management? Delivering cultural change and addressing reputational damage is all well and good, but one would have to believe that it will take resources away from ‘profit centres’ and constrain non-interest income in a bit to prioritise community expectations over shareholder expectations. 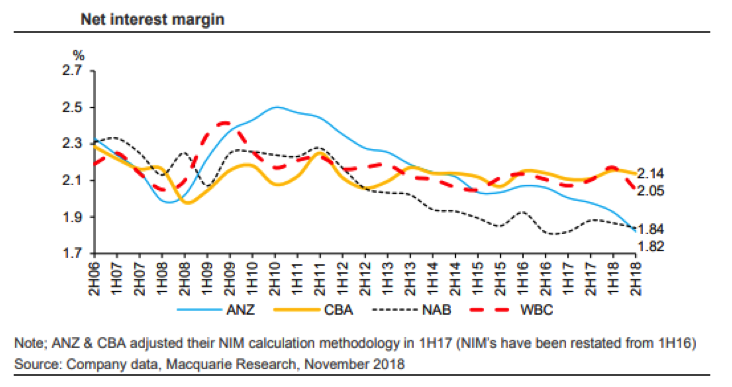 Given the pressure on Net interest margins (NIM) and non-interest income, there is little doubt management will have a significant focus on costs. This focus will nevertheless be made all the more challenging by the need to invest in technology. With earnings constrained it’s very difficult for banks' share prices to move higher without a change in market sentiment driving a Price-to-Earnings (P/E) rerating. In fact, we are of the belief that any P/E rerating is more likely to be lower given the tempered outlook. After decades of P/E expansion, markets have arguably reached the conclusion that the prospects for capital growth have diminished relative to previous decades. There is a realisation that bank ROE’s are under pressure from various angles with the business outlook starting to resemble that of a utility, as opposed to an engine of growth. Going forward, we don’t necessarily believe the bank share prices are going to fall off a cliff, instead, we feel the banks are most likely to continue oscillating within a range driven by changes in market and sector sentiment. We foresee a situation where the bulk of shareholder returns comes in the form of dividends rather than growth. “The reasons are house prices are already high, households already carry reasonable levels of debt, so it’s hard for people to borrow even more. And remember what fuelled a lot of the ability of people to borrow has been lower interest rates," he said. Those are not the words of some bearish sell side analyst or an international fund manager with a short position on Australian banks. Those are indeed the words of ANZ CEO, Shane Elliot. 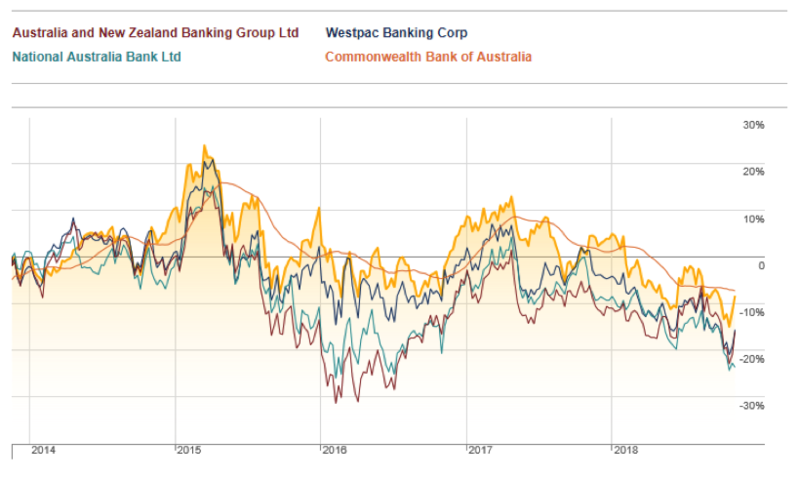 Markets have already factored in the bank share prices all of the above cited negativity plus some more. Thanks for your comment Ahmet. I don't necessarily disagree with your view, as mentioned above; "Going forward, we don’t necessarily believe the bank share prices are going to fall off a cliff, instead, we feel the banks are most likely to continue oscillating within a range driven by changes in market and sector sentiment. We foresee a situation where the bulk of shareholder returns comes in the form of dividends rather than growth." However with a number of headwinds, and business models changing to more closely resemble building societies, I believe it will become more difficult for bank share prices to perform as many have become used to. This article is very precinct but 3.5 years late. You may well be right Ahmet, nevertheless many investors still hold portfolios with 50%+ exposure to banks so perhaps it's a message worth repeating. One of the things that attract me to the banks for my kind of investment is the sustained growth in dividends and the capital gains made from the growth in share prices. The key word here is sustained. When looked at over the period of some 30 years, charts will display fluctuations, but when looked at over longer periods, charts will manifest a clear, unmistakable and sustained growth trend. Despite the high interest rates of the 80s, the higher wage growth at the time, the global financial crisis and so many other market crashes (including the great depression), the growth in dividends and share price has continued to rise with only occasional "minor" dips. Your article "discourages" or advises against investing in these banks, but the context behind that advice is perhaps not so clear. Is it aimed at (relatively) short term share investments with a view to maximising returns or would you suggest that longer term investors should start shedding bank shares? With regard to the ROE chart, do you believe that the downward trend since 2004 is an indicator that will adversely affect the banks' dividend and share price performance over the medium term? You touch on a number of good points Dino. It'll take some time to address but I'll try. I'm not suggesting banks share holders should go out today and sell all their banks. It's never a case of being all in, or all out. Banks could indeed rally from here, but we feel it's going to be difficult to recapture 5 year highs in this environment. People should speak to their adviser about tax implications etc. Instead my general advice would be to suggest that now is a good time to think about weightings to banks and expectations from those positions. 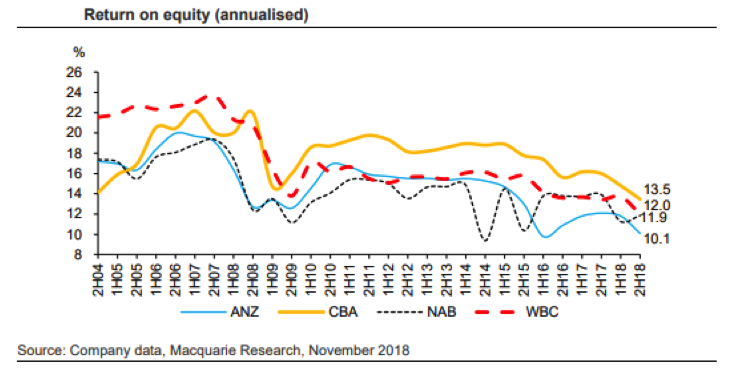 Long term, with the exception of the NAB, the banks have delivered sustained capital income growth. Over the very long term some would argue that you can expect banks to continue to grow simply because of GDP growth and population growth. But I'd caution against assuming banks will only increase over time. You only have to look at European banks or US banks for evidence that is simply not the case. The question is will the rate of growth over the long term remain at a consistently high rate? And we don't think so. To your point on sustainable dividends. Dividend p/sh are ultimately a function earnings. Over the last 30 years earnings have grown rapidly enabling dividends p/sh to increase rapidly as well. We are now at a point where the earnings aren't growing as quickly, therefore dividends aren't growing as quickly either. I don't foresee dividends being cut in the near future, but its certainly a possibility (for some banks more than others) in the coming years if the recent trends in bank balance sheets continue and bad debts increase. Also worth pointing out is that the business models have changed. During the 90's and 00's banks vertically integrated and moved into higher ROE businesses. Generally speaking the media now views this as a bad thing, but at the time the economics and risk of those decisions made sense and the banks profited immensely from many of those decisions. Given the changed business models and greater profitability (and greater ROE) the market rewarded the Aust banks by re-rating them higher to trade on some of the highest P/E's in the world for banks. Due to the royal comm and higher capital requirements, among other things, the times have now changed and banks are returning to their roots which are inherently less risky but lower returning businesses. Therefore, Aust banks should arguably loose some of their P/E premium and arguably trade on multiples closer to there global peers. To answer your question, dividend growth rates (and share prices) and ROE are linked. In simplistic terms dividend growth can be estimated as follows: DivG = ROE x Payout Ratio In recent years some of the banks have been maintaining dividends essentially by increasing payout ratios to offset the falls in ROE. Naturally you cant raise payout ratios forever, and will need ROE to stabilise of rise. For those income focused there are diversified alternatives such some LIC's with lower price volatility then the banks, and growing dividends that are equal, if not higher than the banks. Thank you Michael, that was a very comprehensive answer and I appreciate the additional information included in your answer.